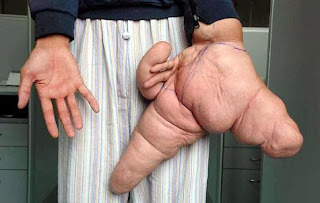 Liu Hua, a chinese man, has fingers thicker than his arm and hopes for a normal life once he finishes having surgery. The operation removed 11lbs of bone and tissue from his hand, which was deformed from birth. “My thumb and index finger are even thicker than my arms, and make my left hand useless. When I go out, I have to wrap my left hand in clothes and pretend I’m holding a bag.” says Liu. It took Shanghai City doctors seven hours to complete the surgery and another one is planned 6 months from now. “We kept his five fingers, and hopefully his left hand will eventually regain normal function,” a spokesman said.